Today, Conserve India employs and trains hundreds of people from Delhi's most disadvantaged communities to clear their streets of the plague of plastic bag waste. Once the waste bags are turned into HRP products they are sold for profits which can be spent in those same communities on education and welfare programmes. 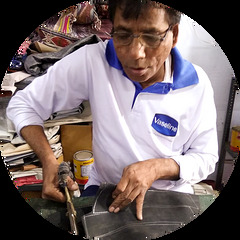 By buying a Conserve bag, belt, wallet, shoe, or necklace, you not only get to be a trend setter with a beautiful, funky piece of high fashion - you will also be helping some of India's poorest people, and its environment. This Rani Bag is 14 inches wide by 12 inches tall. They are lined with a internal zip pocket and a pouch. Rethinking one of their popular tire bags, Indian craftspeople used lots of misprinted leather jeans labels to create this functional bag. The flap closure is secured by Velcro. The bag is 13 by 12 inches with a 4-inch side gusset. This Seat Belt tote is as described made from seat belts. They are 13 inches wide by 11 inches tall. This Seat Belt bag is as described made from seat belts. They are 12 inches wide by 6 inches tall. This Seat Belt bag is as described made from seat belts. They are 16 inches wide by 9 inches tall. Rethinking one of their popular tire bags, Indian craftspeople used lots of misprinted leather jeans labels to create this functional bag with bicycle tire accent. The bag is 13 by 12 inches with a 4-inch side gusset. Indian craftspeople used lots of misprinted leather jeans labels in this large messenger bag. A small security flap hides a zipper pocket on the large flap closure secured by Velcro. The bag is 15 by 12 by 4 inches.